These are my picks for the best trending boy names. Back in 2016, I looked at names rising in the US popularity rankings and picked my favorites. Every one of these names is up substantially over the prior year. Some of these thirteen names feel classic. Others are considered modern, even novel. A few of them have ranked in the 1000 for years, while others are newcomers. 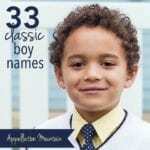 Several of these demonstrate why I think it’s a great time to name a boy. 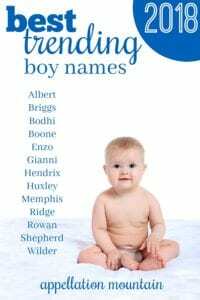 The way we name our sons is changing, and it’s for the better! The only thing these names have in common? They’re all trending, each rising a few dozen places over the prior year. And I imagine we might – fingers crossed! – hear even more of them in the future. It seems like classic names are fixed and unchanging, but that’s not quite true. Instead, many of them cycle in and out of favor. Take Albert, for example. Back in the late nineteenth and early twentieth centuries, the name appeared in the Top 20. It remained a steady favorite in the Top 100 through most of the 1960s. But lately it’s been stuck in style limbo, fading steadily. Until, that is, last year, when it finally reversed course. One possible reason? It made headlines as a possible name for the new Cambridge prince. 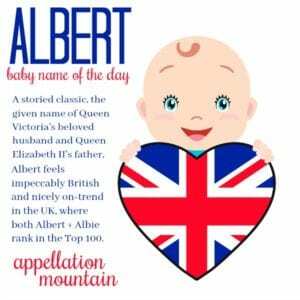 Will and Kate went a different direction, but it might have made some parents look at Albert with fresh eyes. 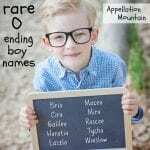 For years, surname-style names for boys came in one flavor: two-syllables, ending-with-n. Then we threw a few ending-with-r names into the mix. Mason, Grayson, and Jackson are still topping the charts, and so are Carter and Hunter. But the next wave is longer – thing Sullivan or Remington – and also shorter, and ending with ‘s’. Brooks blazed the trail. Briggs seems like a worthy and logical successor. Rugged and preppy, Briggs even has a quietly appealing meaning: bridge. I’ve yet to write about Briggs, but check back and I’ll update when I do. Speaking of meaning, there’s no question that parents appreciate Bodhi’s spiritual vibe. In simplest terms, it means enlightenment in Sanskrit. It’s a Buddhist term, with specific religious significance. But it was also Patrick Swayze’s character name in surfer flick Point Break, and there’s an uptick in the name’s use following the 1991 movie, and again after the 2015 remake. Celebrity parents have embraced it, but so have plenty of not-so-famous American families. The takeaway? For many of us, meaning matters more than ever. I’ve yet to write about Bodhi, but check back and I’ll update when I do. 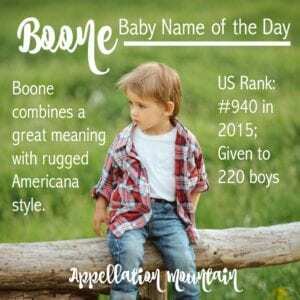 Frontiersman Daniel Boone takes this name in an Americana direction, but I like Boone for its meaning: good, from the French word bon. Even today, a “boon companion” is a dear friend. Brief but complete, Boone fits with Luke and Jack. A handful of television characters have answered to the name; country singer Eric Church welcomed son Boone McCoy in 2011. It’s a cool boy name that continues to trend higher. Read more about Boone here. We’re wild for -o ending boy names, like Leo, Milo, and Arlo. And high value Scrabble letters? From Max to Ezra, they’re all over the boys’ most stylish lists. Enzo has both, so no surprise this Italian name is catching on. Some might recognize it thanks to Enzo Angiolini footwear; others probably think of Enzo Ferrari, as in the sports cars. Successful television series The Vampire Diaries includes an Enzo, too. Sometimes short for Lorenzo, the Italian form of Lawrence, Enzo is also cousin to Henry, via the German Heinz. Call it a classic with a twist – and one that’s powerfully appealing today. I’ve yet to write about Enzo, but check back and I’ll update when I do. Like Enzo, Gianni is a casual Italian name, a contraction of Giovanni, the Italian form of John. The late designer Gianni Versace lends some serious style to the name. The rise of names like Gianni marks an interesting reversal. For generations, newcomers to America dropped their birth names in favor of English-language equivalents; today their grandchildren are reverting to the original forms. Gianni makes a great Italian heritage choice, or might simply serve as an updated form of an evergreen name. I’ve yet to write about Gianni, but check back and I’ll update when I do. We love a good rock and roll surname. After all, Lennon and Jagger rank in the US Top 1000. But Hendrix feels especially promising. Some of it is that appealing letter ‘x’. It also helps that Hendrix is a form of the classic – and quite stylish – Henry. 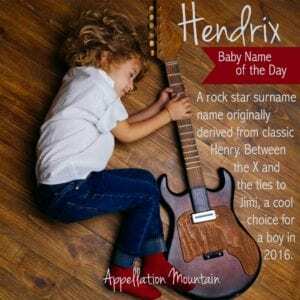 And Jimi Hendrix seems like an especially bold namesake, known as one of the greatest musicians of his generation, despite a career that lasted a mere four years. It makes for an intriguing blend of classic roots, modern sound, and a strong, creative vibe. Read more about Hendrix here. We love that letter x. It helps Huxley feel like an ends-with-ley name that won’t go to the girls. Possible nickname Huck could appeal to some families. It’s literary, too, thanks to British author Aldous Huxley, of Brave New World fame. His grandfather, Thomas Huxley, was a zoologist and defender of Darwin’s theory of evolution. Several other family members excelled in the arts and sciences, as well as public service. That lends a certain gravitas to this edgy appellation. Read more about Huxley here. The original Memphis stood in Egypt, founded sometime prior to the 31st century BC and abandoned around the 600s AD. But most of us think of the Tennessee city, birthplace of Elvis Presley and home to Graceland, and the site Dr. Martin Luther King, Jr.’s 1968 assassination and the National Civil Rights Memorial. It’s a place known for music, which probably explains why US frontman Bono gave the name to his daughter. But it’s also a given name in Greek myth, typically feminine. Today it’s used most often for boys, along with Cairo, while Egypt makes the girls’ Top 1000. It’s a place name rich with positive associations. I’ve yet to write about Memphis, but check back and I’ll update when I do. Now that River has gone mainstream, outdoorsy parents are after alternatives. Ridge makes for an obvious choice. 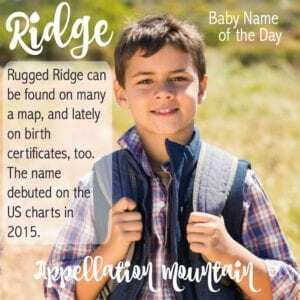 Worn by a soap opera character and often heard as a surname, Ridge feels rugged. It refers to the highest point in a chain of mountains. That might signal achievement, too. It first appeared in the US Top 1000 in 2015, and has yet to slow down. Read more about Ridge here. 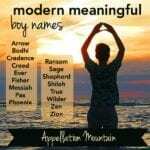 Conventional wisdom holds that once a name starts to catch on for girls, we’ll abandon it for boys. Rowan smashes that idea. It’s gaining for our sons and daughters alike. And why not? It mixes so many influences: lively Irish surnames, tree names, and colorful choices, too. 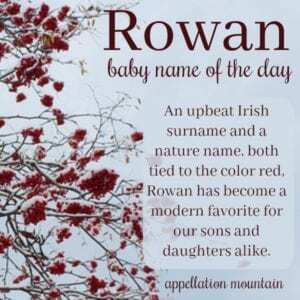 The red-hued Rowan has a longer history of use in the UK, but American parents are still discovering this great name. Read more about Rowan here. Shepherd starts out as an occupational surname, of course, but tending a flock has more than one meaning. I suspect many parents choose this gentle-sounding name because of its spiritual significance. Jesus is often depicted as a shepherd, guiding believers. Spelling Shepard is also common as a surname, and debuted in the US Top 1000 this year, too. 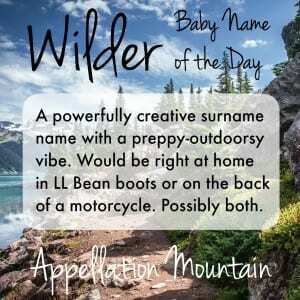 Wilder won our New Names Showdown a few years back, and wow, were we right! I’ve called this a preppy hellraiser name, one that mixes a certain buttoned-down style with a lot of edge. 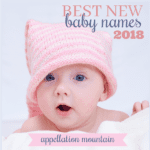 That’s exactly what plenty of parents are after – a name that feels cool and confident, without being too extreme. I like Wilder’s literary ties, too – think Thornton Wilder. 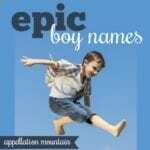 Those are my picks for the best trending boy names of the moment! Are any of these on your short list? Interesting how Albert seems to be the only truly classic name on the rise here, I wonder what that says about how names have evolved…? 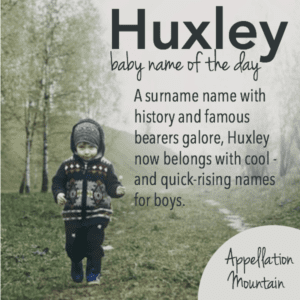 I love Albert, Wilder and nickname Huck, though I’m not a fan of Huxley. Good point! I think part of it is a numbers game. Classic names do trend – down, but also up! And yet, it’s less common for them to make a big splash. (Probably because we know they exist already – so we rediscover them more slowly.) This list is drawn from names that rose dramatically. I could do a list of Trending Traditionals (ooh … I will!) but the movement would be smaller, +10 or +20.